Rabbi Goldberger is the COO of the Kollel, while also maintaining his teaching responsibilities in the Beis Midrash in Toco Hills. Rabbi Goldberger was ordained at Ner Israel Rabbinical College and has a Bachelors of Talmudic Law from there as well. His responsibilities at the Kollel currently include programming, fund-raising, shlepping, cup-stocking, and all other aspects of maintaining the Kollel's largest facility. Rabbi Goldberger is known for his singing talent and is in fact the son of a 7th generation cantor. 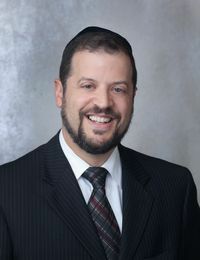 Born in Akron Ohio, Rabbi Goldberger was raised in Silver Spring, MD and joined the Kollel in 1989 during which he also pursued 9 year career with the Torah Day School of Atlanta. Rabbi and Mrs. Goldberger have recently joined the Kollel Grandparents' club!